Mount St. Helens is an active volcano in Washington State, USA (the most active in the Cascade Range). The most recent series of eruptions began in 1980 when a large landslide and powerful explosive eruption created a large crater, and ended 6 years later after more than a dozen extrusions of lava built a dome in the crater. Larger, longer lasting eruptions have occurred in the volcano's past and are likely to occur in the future. 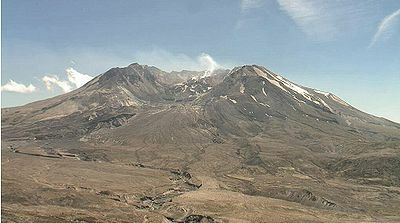 Although the volcano seems to have returned to a period of quiet, scientists closely monitor Mount St. Helens for signs of renewed activity. As a result of the volcanic eruptions, thick deposits of fine laminate accumulated that were later eroded into large canyons. Uniformitarian geologists have long claimed that these features, which are common to earth's geology, were accomplished over great lengths of time. The rapid production of these formations at Mt. St. Helens provided evidence that catastrophic flood geology, such as those ongoing during the Biblical global flood, could instead be responsible. The first sign of activity at Mount St. Helens was a series of small earthquakes that began on March 16 1980. After hundreds of additional earthquakes, a steam explosion on March 27 blasted a crater through the volcano's ice capped summit. Within a week the crater had grown to about 1,300 feet in diameter and two giant crack systems crossed the entire summit area. By May 17, more than 10,000 earthquakes had shaken the volcano and the north flank had grown outward at least 450 feet to form a noticeable bulge. Such dramatic deformation of the volcano was strong evidence that molten rock (magma) had risen high into the volcano. On May 18, 1980 at 8:32 a.m., a magnitude 5.1 earthquake caused the volcano's bulge and summit to break away in a huge landslide - the largest in Earth's recorded history. The landslide depressurized the volcano's magma system, triggering powerful explosions that ripped through the sliding debris. Rocks, ash, volcanic gas, and steam were blasted upward and outward to the north. This lateral blast of hot material accelerated to at least 300 miles per hour, then slowed as the rocks and ash fell to the ground and spread away from the volcano; several people escaping the blast on its western edge were able to keep ahead of the advancing cloud by driving 65 to 100 miles an hour! The blast cloud traveled as far as 17 miles northward from the volcano and the landslide traveled about 14 miles west, down the North Fork Toutle River. The lateral blast produced a column of ash and gas (eruption column) that rose more than 15 miles into the atmosphere in only 15 minutes. Less than an hour later, a second eruption column formed as magma erupted explosively from the new crater. Then, beginning just after noon, swift avalanches of hot ash, pumice, and gas (pyroclastic flows) poured out of the crater at 50 to 80 miles per hour and spread as far as 5 miles to the north. Based on the eruption rate of these pyroclastic flows, scientists estimate that the eruption reached its peak between 3:00 and 5:00 p.m. Over the course of the day, prevailing winds blew 520 million tons of ash eastward across the United States and caused complete darkness in Spokane, Washington, 250 miles from the volcano. During the first few minutes of this eruption, parts of the blast cloud surged over the newly formed crater rim and down the west, south, and east sides of the volcano. The hot rocks and gas quickly melted some of the snow and ice capping the volcano, creating surges of water that eroded and mixed with loose rock debris to form volcanic mudflows (lahars). Several lahars poured down the volcano into river valleys, ripping trees from their roots and destroying roads and bridges. The largest and most destructive lahar was formed by water seeping from inside the huge landslide deposit through most of the day. This sustained flow of water eroded material from both the landslide deposit and channel of the North Fork Toutle River. The lahar increased in size as it traveled downstream, destroying bridges and homes and eventually flowing into the Cowlitz River. It reached its maximum size at about midnight in the Cowlitz River about 50 miles downstream from the volcano. 1980-1986: Large explosive eruption on May 18, 1980, followed by 21 smaller eruptive episodes. The last 17 episodes built a lava dome in the volcano's crater. See USGS fact sheet of activity between 1986 and 2000. 1800-1857: Large explosive eruption in 1800 was followed by extrusions of lava that formed a lava flow on the volcano's northwest flank (Floating Island lava flow) and a lava dome on the north flank (Goat Rocks lava dome). Late 1700's: Layers of volcanic rocks record a variety of activity related to the growth of a lava dome at the volcano's summit, including pyroclastic flows, lahars, and tephra fall. The eruption at Mt. 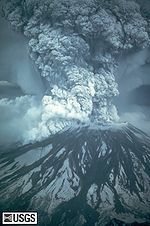 St. Helens on May 18, 1980 was an important geological event because we observed and documented large-scale catastrophic processes, which are extremely rare occurrences. For creation science, the event was most notable because of the rapid deposition and erosion that provided a sizable model of the type of activity likely to have taken place during the great Biblical global flood of Noah. The work done at the volcano during its eruption by geologist, Steven Austin, et. al. to document this event is a highly recommended study. Stratified layers up to 400 feet thick formed as a result of landslides, pyroclastic flows, mudflows, etc., during the Mt. St. Helens eruption. Fine laminae from only a millimeter thick to more than a meter high formed in just a few seconds each. A deposit more than 25 feet in thickness, and containing upwards of 100 thin layers accumulated in just one day on June 12, 1980. Naturalists have long claimed that stratified layer such as those found in the geological column have accumulated over vast periods of time, and that such layers represent season variations. However, the Mt. St. Helens deposits have demonstrated that catastrophic processes are able to create these geological formations in a very short period of time. Perhaps the most remarkable catastrophic events to have occurred at Mt. St. Helens was the rapid erosion that was accomplished by mudflows, landslides, and waves of water. On March 19, 1982 a small eruption melted the snow that had accumulated in the crater over the winter, and a resulting hot mud flow carved a system of canyons up to 140 feet deep and 17 miles long in a single day. The deepest of the canyons has affectionately been called the little Grand Canyon of the Toutle River, and is 1/40th the size of its namesake. The small creek that now flows through the bottom would appear to have carved this canyon over a great length of time, but this unique event has demonstrated that rapid catastrophic processes were instead responsible. The Grand Canyon in Arizona has also been claimed for some time to have been carved gradually by the Colorado River, but it is now becoming clear this American icon is as well the result of catastrophic erosion. Regular and periodic creation science educational opportunities are available at Mount St. Helens. The 7 Wonders Museum of Mount St. Helens is a creationist facility conveniently located near the mountain, which contains a number of educational posters, a small auditorium where seminars are provided, plus a well stocked bookstore. Local groups such as the Northwest Creation Network, the Creation Association of Puget Sound, and the Design Science Association conduct fieldtrips to the mountain on a semi-regular basis. The Institute for Creation Research also hosts tours on occasion led by creation geologists, such as Steve Austin and John Morris. Mount St. Helens and Spirit Lake by Harold G. Coffin. Origins 10(1):9-17 (1983).